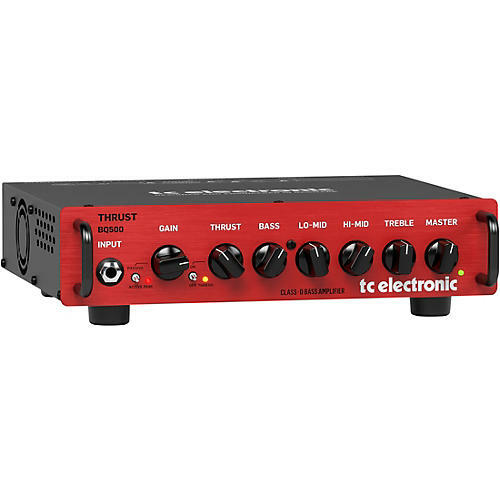 This highly portable head delivers stage-ready bass power and tone. The Thrust BQ500 is a 500-Watt revolution in portable bass amplification, packing more bang for the buck into an ultra-lightweight micro bass head (5.1 lb./2.3 kg) than a warehouse full of discounted fireworks! A custom-designed EQ and MOSFET preamp provides a tremendous tonal palette and realistic tube-like sound and feel. Built for the pragmatic bass player, the 500-Watt BQ500 is designed with the ultimate in portability and power in mind. The cutting-edge Class-D circuit features a high-voltage MOSFET preamp that delivers the authentic feel and dynamic response of a real tube amp. A powerful 4-band EQ lets you sculpt your tone exactly how you like it, while the balanced DI output makes it ultra-easy to connect to the FoH (Front of House) mixing console or your recording equipment. A passive/active switch optimizes preamp input for basses loaded with either passive or active pickups for the best tonal response possible. BQ500 features the highly-versatile, single-knob Thrust compressor circuit that accurately sets the dynamic range of your playing and provides maximum punch to catapult your tone across the stage. BQ500 is also the perfect practice tool thanks to its high-quality headphone amplifier with speaker emulation and AUX input, which lets you jam along with all your favorite grooves, songs or tracks. With 500 Watts of Class-D amplifier technology, a virtually unlimited tone palette and the ultimate in portability, Thrust BQ500 will quickly become your go-to amp for the studio or the stage. Rugged steel construction makes Thrust BQ500 superbly roadworthy and ready to rock!